Editor’s Note: If any of you happen to be fluent in Norwegian, you could pick up the November 2011 issue of Metal Hammer (available only in Norway and only in Norwegian) and read this interview in its mother tongue. 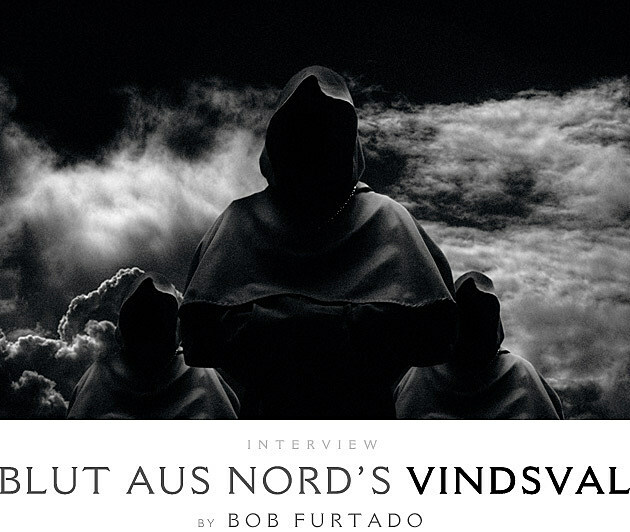 For our readers without this ability, we present a translation of guest contributor Bob Furtado’s Q&A with Vindsval below. In the wake of true rebellion lies a purity and truth that I feel has long been abandoned by the blackened hordes. Blut Aus Nord carelessly warp the sound of traditional black metal, and forge a sound which, for good or bad, transcends the rules and virtual parameters of the genre. As you will read in the Q&A below, adolescent scorn or the praise of the enlightened will have no effect on Blut Aus Nord, and their art will progress/regress as Vindsval sees fit, with or without us, which we should all take comfort in knowing. Blut Aus Nord have been prolific, the last two years especially. What accounts for this, and whence do you derive your inspiration? What drives you to constantly create? I personally need to create, write and compose music every day. The work of composition is not a hobby, it’s like a catharsis. Blut Aus Nord is like a concrete representation of my own spiritual and philosophical evolution, a temple built for my own faith, and this faith is an endless and powerful source of inspiration. Our new label, Debemur Morti, allows us to work exactly like we want and need, and it’s very exciting to work with passionate and motivated persons. This signing is a new birth for Blut Aus Nord. Do you ever create music with anyone in mind aside from yourself, or consider how it may be perceived by a specific person or type of music fan? Vindsval is solely credited on The Desanctification. What are the advantages to working alone? The trilogy 777 is a very personal project – it was absolutely impossible for me to let someone else work on it. It was the same thing for MoRT – this is my soul and my flesh. What you create musically is diverse, and obviously incorporates elements that may be considered unorthodox for a black metal band. Having said that, do you consider Blut Aus Nord black metal, and how important is it to be known as such? We absolutely don’t care about that. Black metal is a feeling, not a typical kind of riff, sound or attitude, and this feeling is the essence of our music. If you can understand this point of view, Blut Aus Nord will be a black metal band. If not, that’s not a problem. How important to Blut Aus Nord’s identity is isolation from the so-called scene or isolation in general? Philosophically, as well as musically speaking. We don’t want to be a part of a “scene”. Blut Aus Nord is an artistic project, totally independent. If you accept to obey a certain form of rules concerning the sound, the style, the attitude, the visual or musical approach, you kill every form of creation. A musical scene is a limit, but art is limitless. The black metal feeling represents this absence of limits, the real subversion/opposition is here. How do you feel about people’s perceptions of Blut Aus Nord? Do you acknowledge praise/criticism such as reviews from the press or opinions expressed by fans of your music? A few years ago we tried to read everything about us, today we don’t care at all. We can’t control perceptions of our music, so we let people alone with our work and we don’t read anything about BAN. The music is a personal experience; you receive it with your own references, your past and your soul. It’s useless to influence the listener, useless and clumsy. Blut Aus Nord have somewhat of an anti-image aesthetic – aside from album art there are no pictures of you in typical metal poses. Aesthetics, for good or bad, are a huge part of how people perceive a band, and it is often how people decide if a band is something they should seek out. I believe the limited image approach to be a good thing, as the only thing to consider is the music. How do you feel this has served Blut Aus Nord? This lack of image is definitively not good for the promotion of the project; a lot of magazines refuse to work with us just because we don’t give them proper photos with typical metal postures. But we have always considered that our art was the only important thing – we are not rock stars and we are not important in the process, Blut Aus Nord is a faceless entity, dehumanized and without ego. Personally I’m just a vector between the inspiration and the final result. If Blut Aus Nord were to become commercially successful, readily accepted by the mainstream, how would you react to that? Success is not a problem; the way to success can be a problem. If a lot of people like and buy our work, that’s great. Many bands attempt to incorporate their geography/nationality/heritage into their sound and image. Do you think of Blut Aus Nord as projecting a definitive sense of its French origins? Absolutely not. Blut Aus Nord is like the sound of the universe, far from this kind of earthly, petty concerns. I know you have stated in the past that live shows were not for Blut Aus Nord, but if I may I ask you to speculate, would it be possible to do Blut Aus Nord’s music justice in a live setting if given the proper resources, and if so how would you do that? Our music is a solitary experience. Would you ever consider creating visual accompaniment for Blut Aus Nord’s music? Also, how would you feel about a fan or an outside entity generating visual representations of your music? When things are well-done that’s not a problem, and I like to see someone else give another interpretation of our work, sometimes it’s very interesting. You’re right, we’ll try to work on this facet in the near future – our music could be a great support for a visual creation. We may try a few things with different persons during coming months. Is there anyone you would like to collaborate with musically or otherwise? Diamanda Galás, Lisa Gerrard, Nils Petter Molvaer, and Dälek. Are there active bands you would support, metal or otherwise? The Wounded Kings, Negative Plane, Autechre, Ahab, Krallice, Abigor, Katharsis, WovenHand. You have performed vocals for Monolithe – any plans to work with Monolithe again or release any more material from The Eye? No, just as a guest on the third album of Monolithe (still not released). Concerning The Eye, I’d like to release a new album, maybe in 2012. I’m also working on two other new projects called Brumes and Vjeshitza with K., the drummer of Spektr. Would you have any interest in discussing what you use in regards to your musical equipment? Absolutely not. That’s not important. I just like old instruments, old guitars, because I can modify them. The material is really not important, I don’t spend money on these details. How do the mathematical or technological aspects of creating influence your music? Can technology dilute art? Nothing can dilute art. Art is creation, and if you need more technology to obtain a precise result, where is the problem? We have to dilute technology in the process. Concerning mathematics, they are the starting point of the rhythmic construction for a few Blut Aus Nord compositions like “Ellipsis” (on Odinist) and “Inner Mental Cage” (on The Work Which Transforms God), it can be a different approach, very interesting. Would you care to elaborate on lyrical themes and content of The Desanctification? Before the learning of freedom, of instinct, of pure life, this man disowns God. The Desanctification represents this precise moment of monumental solitude. God is dead (no matter), but you are still the consequence of past centuries, you are still a reaction, the slave of your thought patterns, and they create a new form of endless fear. This is The Desanctification, the distress of an orphan face to face with the morbid breath of the universe. In the past you have invoked the magician Aleister Crowley. How important has Magick, Thelemic philosophy and the like been to Blut Aus Nord’s sound, philosophy, or the soul of the band? Yes, the works of Aleister Crowley are very interesting. I have a serious passion for Eastern philosophies, and Crowley is a magical key of comprehension of these subjects. Blut Aus Nord is a deeply occult project, and the essential principle of occultism, mysticism, is to meditate on the things beyond the veil… beyond the symbolism. This point is the convergence of every myth, religion and belief, and in this sphere, Crowley represents another different way of understanding… one of many. Would you like to explain or elaborate about the cover art for The Desanctification? No, for the reasons mentioned before. The cover art is the veil created to be understood, not explained. It seems there were some things done vocally on the new album that I haven’t heard on previous albums. Would this be an accurate statement? Specifically the beginning of the song “X”. You’re right. I tried to create something in the vein of the old progressive bands of the ’70s, like Magma. Their use of voices and harmonies was very different and unique, melodic, celestial and… disturbing at the same time. How does The Desanctification differ from Sect(s)? The Desanctification is less aggressive than Sect(s), more industrial. This album is like a ritual, a sad ritual. Sect(s) was a brutal and desolate admission of failure, like the tragic sound of perdition. This second chapter represents a new possibility, and the musical content is the concretization of this new possibility. I tried to work with unusual harmonies (for BAN), different song structures, sometimes repetitive and totally hypnotic. A few people told me that the album was a bit psychedelic, very strange for Blut Aus Nord, but that’s true and I like this idea. The Desanctification is a very strange album and, the most important thing, the perfect continuation of Sect(s). The whole trilogy will be an extremely coherent, massive musical piece. How will Cosmosophy (the final album of the trilogy) differ? Cosmosophy will be the most atmospheric album of the trilogy. I’m going to include more electronic sounds and new things in the sound of Blut Aus Nord, like a jazzy approach in a few parts. As usual this third chapter will be a different and unique experience.